Some might say living with friends is a bad idea but in my experience it's super fantastic. This is what awaited me when I returned from interstate after Mum Pham's passing. Only true friends can gift you a whole pile of your favourite things! There's bulk toilet paper because the worst thing that can happen in my universe is running out of toilet paper. Potato chips (plain and salt & vinegar are my faves) are my weakness. I cannot say 'no' when offered potato chips or the ice cream that isn't in this picture but written on the note that you also can't read. It says "AND ULTRA CHOC ICE CREAM IN THE FREEZER." Everyone needs a fizzy drink to wash down the potato chips and they knew I've recently quit coca cola so Sprite it is! And 'Cheezel' in one of my favourite words to say in the English language and when I eat 'em I feel the need to say 'Cheezel' every time I pop one delicious orange ring in my mouth. Cider is my current alcoholic beverage of choice. Rekorderlig's ciders in all flavours are one of my faves, though as of last week at the launch of Bulmer's new Blackcurrant cider is high on my to-drink list as you can see in this picture. Everyone else picked a prop (that's the lovely Style-Paws as the centrepiece) but I refused to put my drink down. Tea is one of my comforting daily rituals and Arnott's Butternut Snap cookies don't crumble when you dip them into Twining's tea. I need something to do while I sip my cups of tea and one of my favourite pass times is reading shop catalogues. IKEA, Big W and ALDI are my favourites - how did they know? My housemates are awesome!! I went off Cruskits for a while when I went and got me some epic food poisoning and had to live on Saladas, Cruskits and Hydrolyte water for two weeks. But now I'm back to piling on toppings and spreads and telling myself it's a healthy snack because it's sitting on a Cruskit base. After the food comfort there's the pampering. Palmer's Cocoa Butter Formula Lotion is on of my favourites because it makes my skin feel smoother and more supple and smells so delicious. I love smelling like a chocolate bar! Are you getting from this blog post that I am fond of food and all food-related products? Speaking of food, one must not consume nail colour no matter how much it looks like yummy yellow banana. 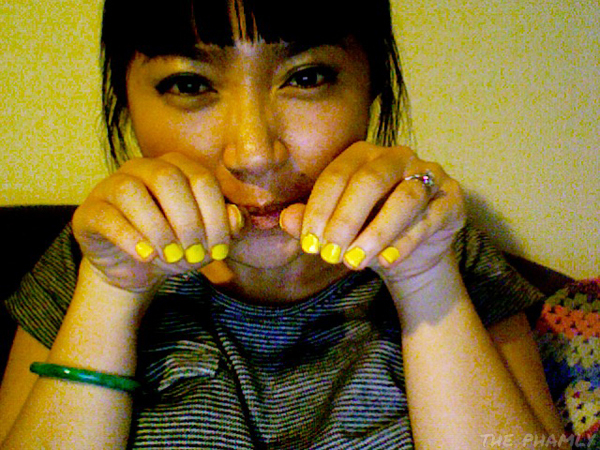 I've just painted my nails this lickible shade of Maybelline Mini-Colorama's Urban Yellow. The cherry on top of my huge pile of favourite things is fresh flowers. Every house needs fresh flowers to make it feel nice. How lovely!